Because students have been asking many questions about volcanoes the next series of blogs will be about— you guessed it— volcanoes. 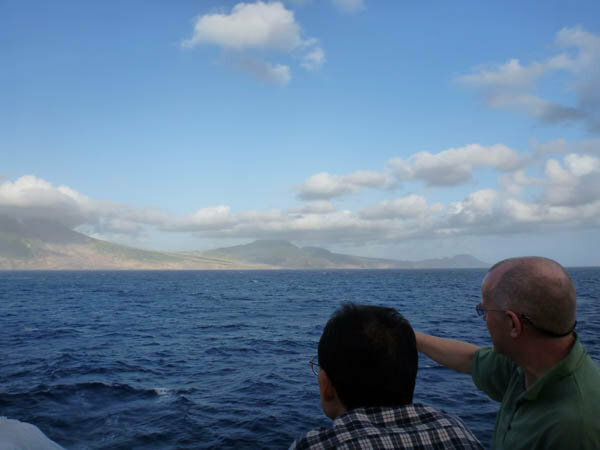 We are currently in the Caribbean Sea along the Lesser Antilles islands which are made up of a long chain of volcanoes. Several of these volcanoes are active today and even from those that are not active we can read the story of their eruptions in the deposits they leave behind in the ocean’s sediments. Expedition 340 scientists are looking at the material that erupted from the volcanoes and entered the sea. These are called submarine (underwater) deposits and because they are in the ocean the volcanic material is well preserved. Deposits on land are exposed to erosion (wind and rain), and only provide incomplete records of a volcano’s history. Thank you to Daisuke Endo for sharing his picture of Montserrat’s Soufrière-Hills volcano. Volcanoes come in three main types. We will talk about the type here in the Lesser Antilles, these are the ones most people are familiar with and probably draw if asked to sketch a volcano. These are tall, conical volcanoes like those in the Cascade mountain range in Washington and Oregon in the US, Mt Fuji in Japan, or Taranaki in New Zealand. These volcanoes are called stratovolcanoes or composite volcanoes and are always associated with places that have earthquakes. Stratovolcanoes form at plate edges where oceanic crust (7 to 10 km thick) or lithosphere (100 km thick and including the crust at its top and part of the mantle underneath) is pushed under or subducted beneath other crust. The crust on the top can be other ocean floor or a continent. As the ocean crust goes down into the mantle (the layer beneath the crust), sea water trapped in the sediment is released and causes the overlying mantle to melt. This melt is called magma. Magma slowly rises up taking thousands of years to reach close to the surface and then it can erupt. Stratovolcanoes often erupt very violently and are very dangerous. They erupt both lava and ash. The ash clouds can billow out tens of kilometers into the air!